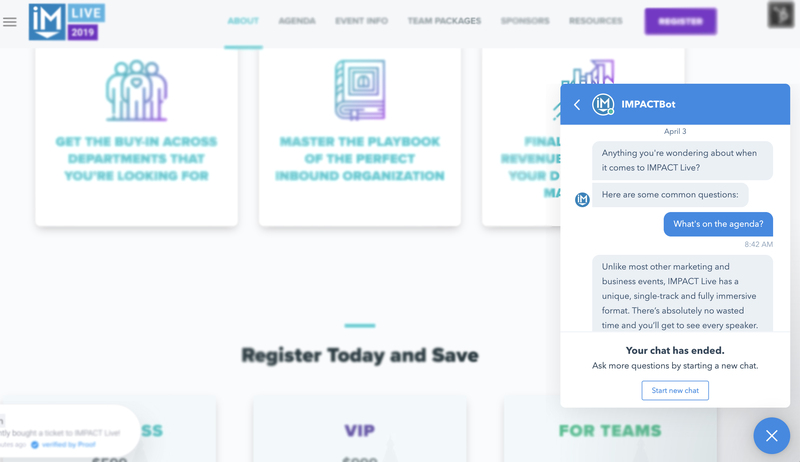 HubSpot Conversations was first announced during INBOUND 2017 and fully rolled out in 2018 as a competitor to other live chat and chatbot solutions such as Drift and Intercom. According to HubSpot “With live chat, team email, and an easy-to-use chatbot builder, HubSpot gives you the messaging tools and context to have personalized conversations with prospects and customers at scale — for free!" Since this initial release, HubSpot has been progressively making updates. Today, HubSpot Conversations includes inboxes for chatbot conversations, live chat, and a shared team email inbox (meaning sales, marketing, and customer service teams can come together in one place to view and manage all conversations). In the past six months alone, they have even released updates such as consolidating the targeting and messaging workflows into one place in the portal, adding the ability to use file attachments, and adding a mobile-optimized chat widget. However, the tool is still not quite up to par with its competitors. 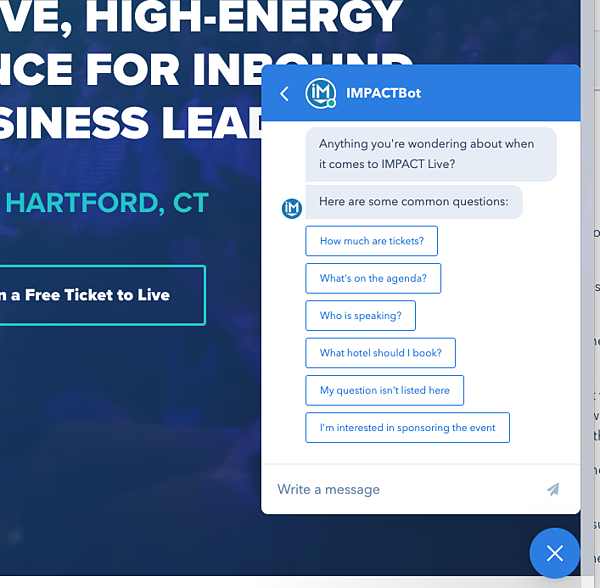 To understand exactly how it works, IMPACT converted our entire website chatbot and live chat functionality to HubSpot Conversations at the beginning of 2019. After three months of setting up and using the tool, I’ve learned quite a bit. So, here is an honest review of HubSpot Conversations and what you need to know if you decide to use it. Before we dive into the pros and cons, there are a few things you need to know about HubSpot Conversations. First, different tools refer to the set of steps in the conversation setup as different things. Drift calls them playbooks and HubSpot calls them chatflows. 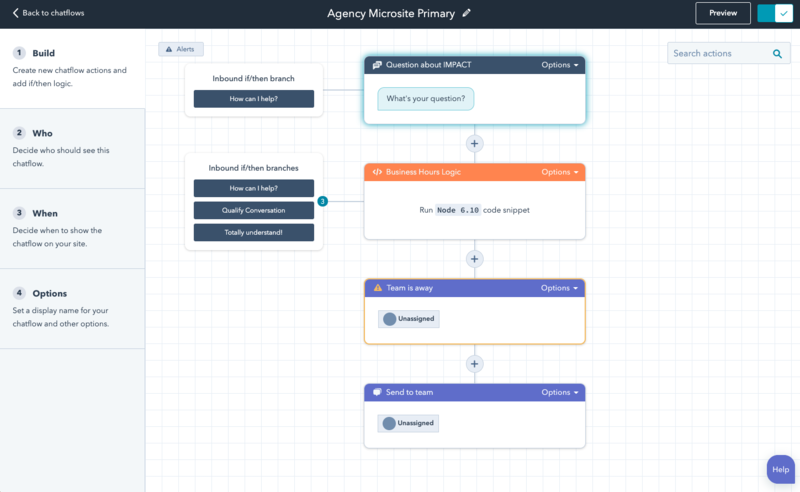 Chatflows are the workflow-like steps you can set up on the back end to help visitors interact with your bot and eventually be connected to a customer service representative if needed. Second, while most conversational best practices say that you should create chatbots with a “way out” for visitors to get in contact with a human if the bot cannot help them; HubSpot’s tool is not built with this idea in mind. You can work around the default settings to get a bot to turn into a live chat conversation, however, when you first start building your chatflows in HubSpot, you’ll be asked to choose between setting up live chat and building a bot. Plus, if you want to create a bot that does anything other than qualify leads or book a meeting, you’ll need to create a bot from one of the HubSpot templates and then delete all the actions to start from scratch. When you build a new chatflow you can choose from the above options. When creating a new chatflow in HubSpot you can choose either live chat or one of the bot options. Finally, there is some important permission information to note. Only users with Admin access can create and edit chatflows and only Service Hub users can create support bots. If you want to route a conversation to a specific person using the routing rules, they need to have a paid Sales Hub or Service Hub seat. Alright, with that out of the way, let’s dive into the pros and cons of HubSpot Conversations. One of the most obvious benefits of HubSpot Conversations is it’s yet another tool right within HubSpot. This means you don’t have to learn much to use it because it looks and feels like most other HubSpot tools. Plus, it’s already closely integrated to your contact database and the chat transcripts automatically save to the contact record of known contacts. You’ll also save time because you won’t have to create and onboard accounts for team members who need to assist in responding to conversations. Finally, you can personalize chatbot conversations with data from contact properties in your database. Personalize your chatbot replies by adding contact or company information. 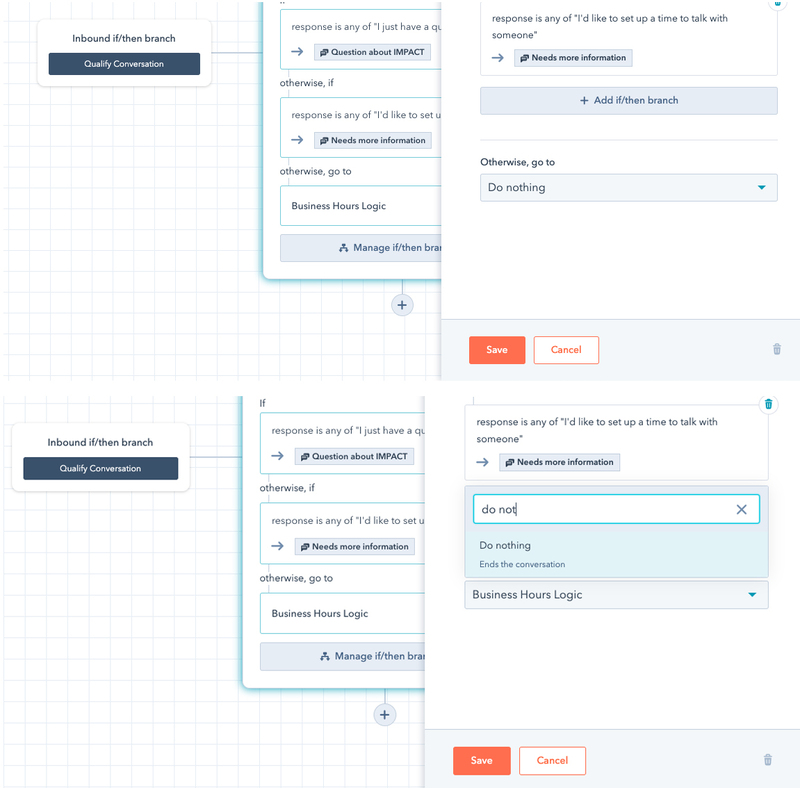 Building chatflows in the chatflow builder is very visual and fairly easy. You can create custom messages, quick replies for visitors to choose from, and more, though it does get challenging when you want to go back into a previous set of responses as there is no “back” option. You’ll also find that the more complex your chatflow becomes, the harder it is to manage. If you want to allow visitors to dive into a topic and then go back to the beginning and be presented with the same original options, then you’ll have to recreate the if/then logic each time even though you can reuse your responses. 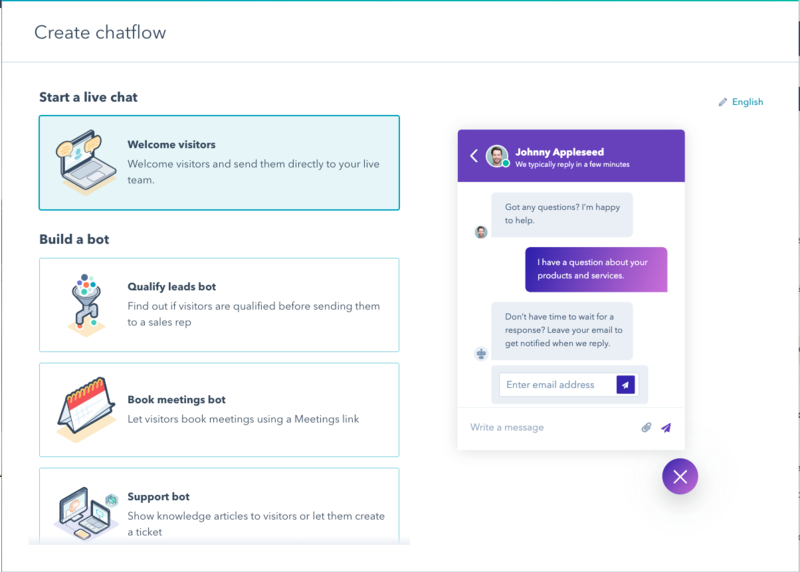 Since the tool is part of HubSpot, you can enroll someone in a workflow from a chatflow conversation. Here’s what it looks like when you enroll a contact in a workflow. This means you can deliver content directly on a page without sending someone to a subsequent landing page with a form and then a thank you page. You can capture someone's email (or any other information) via the bot, log it to the contact record, and enroll the contact in a workflow that sends the content and any follow up information. Note: enrolling contacts in a workflow from a chatflow is available to professional and enterprise HubSpot accounts only. There’s no question that booking meetings in a chat built with HubSpot Conversations is one of its best attributes. Simply link up a meetings URL to a step in your chatflow and the bot will automatically take care of the rest. This is what it looks like when a visitor sets up a meeting using your chatbot. There are, of course, a few stipulations. If you have GDPR settings enabled for your meetings link, you will need to turn it off for the link you use in chat. Fortunately, the GDPR functionality is available directly within chat and is the same as the rest of HubSpot. If you do not turn off GDPR on your meetings link, your bot cannot schedule the meeting and will prompt visitors to open your meeting URL in another window to complete the booking process. You also cannot have any custom fields on your meetings link for it to work in HubSpot Conversations. However, you can ask for information within the chat conversation and write it into the contact record before triggering the calendar bot. One of the biggest challenges I encountered when setting up our chatflows is that it’s insanely easy to miss an entire conversation. We set up our chatbot to allow someone to reply with their own question or ask for help if none of the suggested replies were what they needed. However, if you do not route the end of every path like this in your chatflows to a user or part of your inbox, people will reply and you will not be notified. Essentially, you are not automatically notified of all conversations that are started with your bot. Plus, we incorrectly assumed that the “do nothing” option would just leave the chat open for us to respond. Instead, it actually ends the chat - which you only see when you click into that open when building your chatflow. When you set your chatflow to "do nothing" it actually closes the conversation. In some cases, your visitors wind up stuck without a way to keep the conversation going. We noticed a few really weird ways this happens. For example, unless you enable “free text input” by unchecking the “disable free text input” box, users cannot type their own question;They’re forced to use the quick reply options. However, the chat box for the visitor will still say “write a message” even though they’re not able to type in the text box. The conversation will say "write a message" even when users cannot type. After a visitor selects a quick reply option, they lose the ability to enter open text to type any additional information unless you specifically tell it to allow them to reply with text. In some cases, the user can only send one message. Finally, if you don’t leave a conversation open for a free text reply then when a user selects a quick reply and gets an answer, the chat automatically ends. Chats will automatically end after an answer is sent if no next step is set. It does appear, at first, that there are a lot of options for page targeting for HubSpot Conversations, however, you’ll quickly find yourself stuck when trying to create service or product-specific bots. We wanted to have a bot specific to video services but have our regular services bot remain on other pages. Turns out, you can’t do that. It should be as simple as URL starts with “agency.impactbnd.com” AND does not contain “video,” but, there is no AND option, just OR. You also cannot target or exclude certain countries or IP addresses. If you only do business in certain countries or regions this would be really helpful. Plus, it means you should probably have the GDPR settings turned on for chat regardless of your location because anyone can engage with your bot. I also found the chat widget to be limited. It has recently been updated to be more mobile-optimized, which is a nice improvement, but, you cannot delay the chatbot or have it appear on a certain scroll depth. I also wanted our bot to show up as a person (me) so visitors would know they can talk to a real person through our chat, but then have the bot take over depending on what option the person chooses. This is not an option. You can either have it start as a bot or trick people into thinking your bot is you (which I don’t recommend). Remember how I mentioned earlier that you have to route your conversations to a person or inbox or you won’t be notified of conversations? Well, as soon as you do this, you apparently overwrite any offline message settings you’ve set up for your bot. Once a person is assigned to the conversation, it is no longer a bot conversation and the bot settings no longer apply. This means I have to manually set myself to “away” at the end of each day and “online” every morning. This alone didn’t solve the whole issue, either. In fact, HubSpot finally had to create a custom code snippet for us because of how difficult it would be to have offline settings work for each of our bots. They did say they’re working on an update soon that will help all chatflow settings respect overall availability and business hours. Above you can see the not-so-pretty hack we have to make sure we don’t miss conversations but aren’t expected to reply when we’re offline. Even though HubSpot Video exists just about everywhere else, it hasn’t made it to Conversations yet. While you can easily insert videos into email replies, you cannot use them in bot replies just yet. If you’re a human in a live chat conversation, you can technically insert a video but it will show up as linked text, not a thumbnail as most are used to. So, you will have to give enough information in your message to get someone to click that link. Alternatively, you can create snippets ahead of time that have more information but these will just include linked text as well - no video thumbnails or linked images yet. HubSpot did recently roll out an update that allows for attachments to be added to chatbot replies. Unfortunately, this does not technically include video. Meanwhile attachments added as videos or PDFs show up as a file without a preview image or thumbnail. Pictured above is what attachments and video look like in a chat reply. While images and animated GIFs can be used, they’re not quite there with video yet. When building multiple chatflows across your site, you’ll find that some things can be said in the same way in multiple bots. Maybe it’s information about how to subscribe to your blog or your pricing information. What I found to be the single most frustrating aspect of HubSpot Conversations is that absolutely nothing you create in one chatflow is available in another one. This means if you build out an entire chatflow with questions, quick replies, answers, and calendar links - you can’t use it again in another bot. You can use it in the same chatflow in a new branch but you cannot use it in another chatflow. You’re also not able to clone and edit a message or reply. Furthermore, when you assign a message to a team member, you cannot reuse the messages for each of the three required responses. You have to rewrite them every time. I highly recommend having multiple windows open and being ready to copy and paste. A common feature in many live chat tools is the ability to quickly insert saved replies to questions you find yourself answering frequently. In HubSpot Conversations, you use “snippets” for this. Unfortunately, this isn’t the only place snippets are used. If your sales team is also using snippets, you’ll see them all when you try to use a snippet in a chat reply. As most teams have multiple users all creating snippets, it can be really difficult to find the one you’re looking for quickly (especially in a live chat when time is of the essence.) Any folders built into the snippets tool will not show up when using a snippet via the # shortcut in a conversation. We made this a bit easier by naming every snippet intended for chat use with “chat” in the beginning. This means we can type #chat and start to find the one we’re looking for a little more easily. It’s also worth noting that personalization tokens in snippets will not work in conversations. Of course, some are more comprehensive and robust than others. In addition to more features, the more expensive chat tools typically come with integration functionality. While a free tool, like Conversations, can be a great place to start, when it comes to 1:1 conversations with clients and prospects, you want to integrate with your contact database. Without that, you miss an opportunity to build your relationship with prospects and you may leave customers feeling like you don’t care enough about them to know who they are. Should You Use HubSpot Conversations? So, what’s the verdict? It’s been over 18 months since the tool was released and, while there have been some significant updates to the tool, it still lacks some pretty vital components for a truly optimized conversational strategy. If you’re already a HubSpot user, you may want to look into the HubSpot Conversations tool, especially if you’re just beginning your conversational marketing and selling journey. If you’re in the market for a free tool and are just getting started, I’d check out HubSpot Conversations and compare it to the other free options available. However, if you’re looking for a really robust chat solution, you may want to look into a tool that integrates but has more comprehensive capabilities.